Planets having atmospheres rich in helium may be common in our galaxy, according to a new theory based on data from NASA's Spitzer Space Telescope. Alien worlds with helium skies might be fairly common throughout the universe, researchers say. One such helium-rich exoplanet might have already been discovered about 33 light-years from Earth, scientists added. In the past two decades or so, astronomers have confirmed the existence of more than 1,800 extrasolar planets. Among these exoplanets are strange worlds called warm Neptunes — planets that, at 10 to 20 times the mass of Earth, are about the mass of "cold Neptunes" such as Uranus and, naturally, Neptune, but are as close, or closer, to their stars than Mercury is to our sun. Astronomers had assumed that Neptune-size exoplanets would possess rocky or liquid cores wrapped in atmospheres dominated by hydrogen and helium, much like the giant planets in our own solar system. However, planetary scientist Renyu Hu at NASA's Jet Propulsion Laboratory (JPL) in Pasadena, California, and his colleagues reasoned that warm Neptunes are so close to their stars that stellar radiation may have dramatically altered their atmospheres. 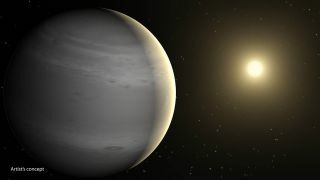 The researchers discovered that warm Neptunes could often have atmospheres enriched with helium. "They could be fairly common," Hu told Space.com. The high levels of extreme ultraviolet radiation that warm Neptunes would receive from their stars would cause their hydrogen to waft away. "Hydrogen is four times lighter than helium, so it would slowly disappear from the planets' atmospheres, causing them to become more concentrated with helium over time," Hu said in a statement. One way to detect such a planet would be to note the color of its sky. Neptune is a brilliant azure blue because of methane. However, the scarcity of hydrogen on helium-atmosphere worlds would mean that methane, which is composed of one carbon atom and four hydrogen atoms, would be rare, while carbon monoxide and carbon dioxide, which are composed of carbon and oxygen, would be far more common. As such, a helium-sky planet would probably appear grey or white, researchers said. One warm Neptune called GJ 436b that is peculiarly low in methane might be such a helium-rich planet. NASA's Spitzer Space Telescope found that GJ 436b, which is located about 33 light-years from Earth, is also rich in carbon monoxide. A number of other features would also help set helium-sky worlds apart. For instance, an atmosphere rich in helium would be puffier than one made of carbon dioxide or nitrogen because helium is lighter than either of those two gases, "and this feature makes the helium atmosphere more observable," Hu said. In addition, because helium is easier to heat than hydrogen, a helium-rich planet is more likely to have a hot spot facing its star than a hydrogen-rich world. Future research could use NASA's Hubble Space Telescope to look for more warm Neptunes with carbon monoxide and carbon dioxide in their atmospheres, and NASA's upcoming James Webb Space Telescope might one day directly detect helium in the skies of these planets. "Any planet one can imagine probably exists, out there, somewhere, as long as it fits within the laws of physics and chemistry," study co-author Sara Seager of MIT said in the same statement. "Planets are so incredibly diverse in their masses, sizes and orbits that we expect this to extend to exoplanet atmospheres." Hu, Seager and their colleague Yuk Yung of JPL detailed their findings in a paper that will appear today (June 24) in the Astrophysical Journal.